To compare the concentrations of 13 different elements in nail samples from pre-eclamptic and normotensive pregnant women. The study site was a regional hospital in Durban, KwaZulu Natal. Nail samples were collected from normotensive (n = 33) and pre-eclamptic (n = 33) pregnant women. Approximately 0.02 g of nail samples were digested in 70% nitric acid and analyzed using inductively coupled plasma-optical emission spectrometry. Analytes of interest were the following essential elements calcium (Ca), chromium (Cr), cobalt (Co), copper (Cu), iron (Fe), magnesium (Mg), manganese (Mn), nickel (Ni), selenium (Se) and Zinc (Zn) as well as toxic elements, arsenic (As), cadmium (Cd) and lead (Pb). The observed concentrations of bioelements (mean, μg/g), Ca: normotensive (N) 3467 ± 197 vs (PE) 2897 ± 190; Mg: (N) 736 ± 61 vs (PE) 695 ± 59, were lower in pre-eclampsia albeit not statistically significant. Similarly, the observed concentrations of bioelements (mean, μg/g), Cd: (N) 3 ± 0.3 vs (PE) 2 ± 0.4; Co: (N) 3 ± 0.3 (PE) not detected; Mn: (N) 7 ± 1 (PE) 4 ± 0.8, were significantly lower in pre-eclampsia (p = 0.004, 0.0001 and 0.022, respectively). Therefore, this study demonstrated significantly lower levels of Cd, Co and Mn in pre-eclampsia which justifies the need for further research on these elements towards the effective management or prevention of pre-eclampsia which could ultimately also aid in establishing its pathogenesis. The authors would like to express their sincerest gratitude to Nomfundo Mahlangeni (Chemistry Department UKZN), Zinhle Mkhize (research nurse) and Dr. David Ofusori (Optics and Imaging Department UKZN). Professor T Naicker and Professor J Moodley contributed to the concept and design of the study. 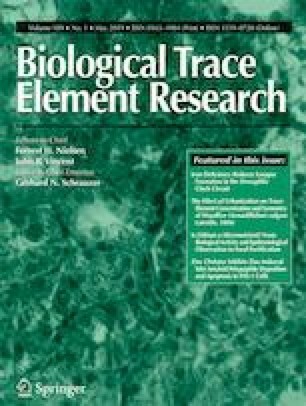 C Soobramoney, Dr. K Maduray and Dr. R Moodley contributed in the analysis of the trace elements and statistical analysis. All of the authors contributed to compiling and editing the manuscript. The authors would like to thank the College of Health Science (UKZN) and National Research Foundation (NRF) for funding this project.